If you told Bryan Dougher, Danny Carter, Tommy Brenton & Dallis Joyner in 2008 that they would win 75 games at Stony Brook, nearly make the NCAA tournament twice, win two regular season America East titles and participate in the NIT two times, they would have probably laughed at you, thinking it was a joke. In the four years since Stony Brook’s Class of 2008 arrived at the struggling America East school, they have accomplished all of the above. The coach that recruited these four high schoolers to Stony Brook, Steve Pikiell, took over a basketball program that was in the midst of a school-wide academic probation issue which accompanied the school’s rise from D-III to D-I athletics. The Seawolves finished a combined 20-67 from 2005-2008, finishing no higher than ninth in the America East conference. Things weren’t quite Binghamton, NJIT or Towson bad, but things certainly weren’t good. That all changed with the Class of 2008. Despite never Dancing, Stony Brook has taken great strides. Scotch Plains (NJ) native chipped in with a healthy 11.2PPG, good enough to make the America East All-Rookie team. Stony Brook finished 16-14, more than doubling the previous season’s win total, before bowing out to New Hampshire in the America East tournament. The Seawolves finished 4th in the America East. The program looked like it was headed in the right direction. 2009-10 was an even better season. 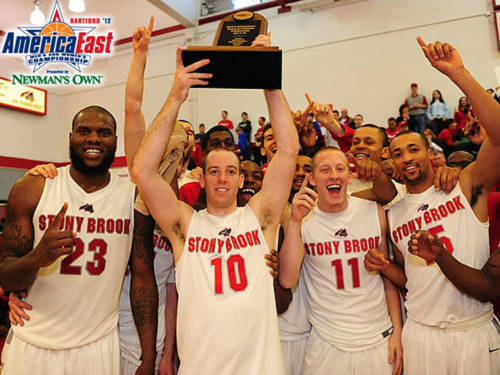 Stony Brook went from finishing 9th in 2007 to winning the America East regular season title with a 22-10 (13-3) record. The Seawolves looked poised to reach their first ever NCAA tournament but surprisingly lost in the second round of the America East tournament to fifth seeded Hartford and then lost in the first round of the NIT to Illinois. Leading scorer Muhammed El-Amin was graduating, it looked like it was back to the drawing board for Pikiell’s program. Steve Pikiell added two important pieces to his Seawolves puzzle in the Class of 2010: David Coley and Al Rapier. Coley, a freshman and Rapier, a JuCo transfer, would add 10.6PPG, filling some of the void that El-Amin left behind. From November to mid-February, Stony Brook actually had a poor season. They were 11-16 with two games remaining, it was unlikely they would see any post-season basketball beyond the America East tournament – they were just another mid-tier low-major program. It didn’t help that leading rebounder Tommy Brenton missed the entire season with a knee injury he suffered during the off-season. Despite the odds, Stony Brook rolled into the America East tournament on a two-game winning streak. The Seawolves slipped by Albany in the first round and shocked the region with a 22-point drubbing of number one seeded Vermont in the semi-finals. They would travel to Boston University to play the two seed Terriers with an NCAA auto-bid on the line. A most improbable run. It looked as if Stony Brook was going to cruise. They held BU’s leading scorer John Holland scoreless for the first 17 minutes and the Seawolves led by 15 early in the second half. Holland took over in the second half, making it a one or two possession game down the stretch before he made two game winning free throws with 2.4 seconds on the clock. Here is the foul. Not only was it arguably not a foul, but Holland might have traveled on the play. Junior guard Bryan Dougher missed a half court heave at the buzzer by inches and Stony Brook’s season was over just like that. It was heartbreak again for the Seawolves, a type they weren’t used to. This season was the last hurrah for seniors Al Rapier, Bryan Dougher, Dallis Joyner and Danny Carter. The latter three had been instrumental in the program’s 180-degree turnaround and Rapier provided valuable experience off the bench as a junior. After coming so close the season before, the team knew they could Dance — the program was no longer a perennial America East bottom-feeder. After starting 3-6 against some tough non-conference opponents, Stony Brook blew through their remaining games, finishing 17-2, good enough for the America East regular season title and a the top seed in the conference tournament. After disposing of Binghamton in the quarterfinals, Stony Brook found itself in trouble against Albany. Fittingly, Dallis Joyner provided a buzzer beating put-back for a 57-55 win. Once again, the Seawolves would have a chance to Dance, this time they would play on their home court, where they were 13-0 this season, against 2-seed Vermont. Stony Brook struggled from the start today. Vermont clogged the paint and forced a ton of tough, contested shots from within the arc. The Seawolves also struggled from deep, shooting a mere 4-19. Stony Brook trailed by 13 with just under seven minutes to play, the dream looked dead, the students were relatively quite. Before one could blink, Vermont’s lead was cut to six courtesy of an 8-1 run by Dave Coley. The crowd was loud, there was hope, this was the moment for Stony Brook’s seniors to finally get over the hump. Vermont suffered through a 10:04 field goal drought to end the game but Stony Brook couldn’t reduce the deficit past four. Senior leader Bryan Dougher fouled out with :36 to play, tears filled with every type of emotion filled his eyes — the dream was dead. Vermont hit their free throws and their small contingent of students rushed the court to celebrate a second NCAA tournament appearance in three seasons. Stony Brook has never been to one. I would imagine that most serious high school basketball players dream of playing in the NCAA tournament. Dougher, Rapier, Carter and Joyner will never know how it feels to play with the giant NCAA logo at the middle of the court and the nation’s eyes watching you. But they do know something else. The 2008 class sparked the emergence of a Division I basketball program that was all sorts of irrelevant before they set foot on campus. From 20-67 in three seasons, to 75-50 (and counting) in four seasons, 2 NIT appearances and 2 regular season America East titles. Individually, Bryan Dougher’s Stony Brook Athletics profile says the record he dreams of breaking is Stony Brook’s scoring record. He did just that with a three pointer at the 12:02 mark in the first half today. Dancing is the ultimate goal, but this is a damn good consolation. The future looks bright. Despite losing three of their top five scorers, Tommy Brenton returns for his senior season (he received a medical redshirt in 2010-11) and Steve Pikiell landed the highest rated recruit to ever sign with Stony Brook, Jameel Warney (Roselle Catholic HS, NJ). Pikiell also received commitments from three other high school seniors in Ryan Burnett, Carson Puriefoy and Ahmad Reid.